VATICAN CITY (CNS) — Cardinal Dionigi Tettamanzi, whom Pope Francis described as one of the Archdiocese of Milan’s “most illustrious sons and one of its most loving and beloved pastors,” died Aug. 5 at the age of 83. Cardinal Tettamanzi was long considered one of the most authoritative voices in the Italian Catholic Church, and his appointment to the College of Cardinals in 1998 immediately put him near the top of Italian pundits’ list of possible future popes. He had served as general secretary of the Italian bishops’ conference in the early 1990s, winning a reputation as a wise leader, a negotiator and a pastor in touch with the real problems of society. Returning to Milan, he taught moral theology in the archdiocesan seminary and served as an adviser to the Milan chapter of the Association of Catholic Physicians. In 1987, he was named rector of the Milan archdiocese’s seminary in Rome. Two years later, St. John Paul II named him archbishop of Ancona. He led the archdiocese until being nominated general secretary of the bishops’ conference in 1991. After four years in that post, St. John Paul named him archbishop of Genoa and, in 2002, appointed him archbishop of Milan. As a priest, bishop and cardinal, he participated as an expert or a member in six meetings of the Synod of Bishops: on the family in 1980, on the laity in 1987, on Europe in 1991 and 1999, on consecrated life in 1994 and again on the family in 2015. 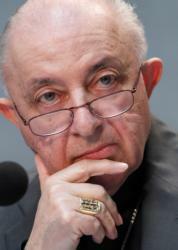 He retired as archbishop of Milan in 2011. Cardinal Tettamanzi’s death leaves the College of Cardinals with 223 members, 121 of whom are under the age of 80 and eligible to vote in a conclave.